You may see these flyers in and around your church this time of year. It is a catalogue called “Gifts With Vision” describing the work of the United Church’s local and global partners. Your donations to the Mission and Service Fund support the work of groups like Defence for Children International (DCI). 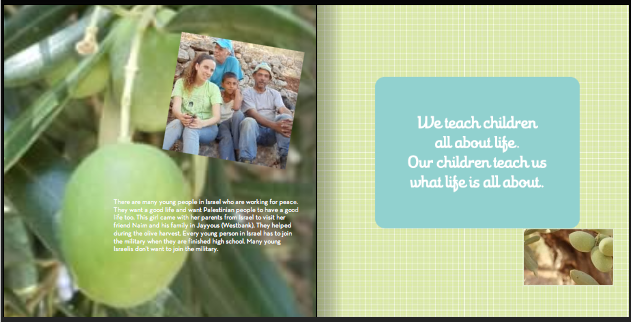 DCI Palestine is a partner of the Church whose work is important as they support children and their families who are negatively impacted by the occupation. For instance they support children who have been arrested and detained and need advocacy, legal and psychological support. The photo of this child is from a visit I will never forget. We made the visit to Arab ar Ramadin al Janubi on my birthday in 2012. This community lives in the “seam zone” –caught in between the Israel Palestine border and the separation barrier which does not follow the proposed border (the 1967 “green line”). The people we visited are Bedouins and were not allowed to build a school for their children who were obliged instead to cross through military check points from the seam zone into the occupied Palestinian territories. Some of the children, as young as four years old, were terrified to make this journey to school every week. So they erected a series of tents and brought in teachers and started their own school. It was an inspiring visit. We spoke with the teachers and the students. They are an example of people’s resilience and courage in their efforts to provide protection and the best education possible for the children. It was an encounter I will never forget. At this time of year, Jesus’ birth, reminds us of families and children who are vulnerable—displaced, homeless, impoverished. In spite of all the consumerism of the season, we are reminded of the miraculous birth and that God will ‘show up’ in the most surprising and humble of places. This season reminds us to give and do whatever we can for peace to come on earth. Watch this video about the Mission and Service Fund of The United Church of Canada supports partners overseas who are working for peace and justice. The views contained herein are personal to me and do not necessarily reflect those of the United Church, my employer, EAPPI or the WCC. If you would like to publish the information contained here (including posting on a website), or distribute it further, please first contact me for permission. Thank you. This fall, students from British Columbia are not going back to school as the labour dispute between teachers and the government continues. I remember this time of year when I was younger. In September when the air starts to get cool, I always felt a little sad that summer was over. But I was also excited about going back to school and seeing my friends. I was eager to get new pens, pencils and notebooks. I would plan what I would wear on my first day back to school and maybe get a couple of new clothes or a pair of new shoes if I had outgrown the oldones. It was a time of new beginnings and curiousity about what the school year ahead would be like. I was excited about advancing insome subjects (and less excited about others). I wondered about the new friends I would meet and what new things I would learn. I have been thinking about how families are coping this year with the interruption to the school year. I have been especially thoughtful about students who would be completing high school this year and what the delays mean for them. I have been reflecting on an interview I heard on CBC about young people from troubled homes or in abusive situations for whom school is a place where they may get help and access to a safer environment. (http://www.cbc.ca/earlyedition/podcast/2014/09/09/street-youth-and-teachers-strike) Whether going back to school is a celebrated or dreaded moment for students, the reality is it has not happened yet for most here. The Barrier in the Qalqiliya Governorate digs deep into the West Bank. As a result, three “Seam Zones” have been created – closed areas stuck between the “Green Line” that delimits Israel from the West Bank, and the Barrier built by Israel partly inside the West Bank. Approximately 57,000 Palestinians live in such enclaves, cut off from the wider West Bank. 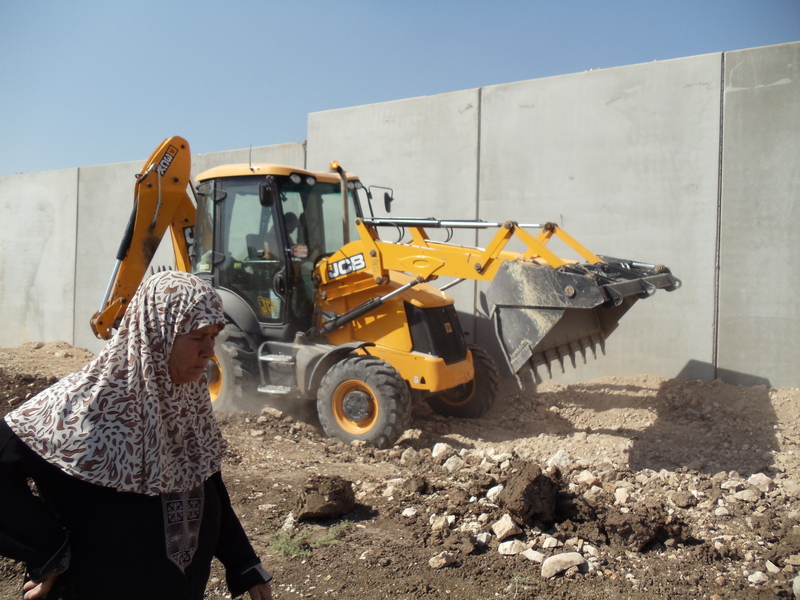 The families have to apply for Israeli permits to continue living in their own homes; their relatives cannot visit them without a permit, which is extremely difficult to obtain. Families are forbidden to leave the tiny enclaves, unless they cross on foot through checkpoints in the Barrier towards the West Bank. They have to wait, sometimes for hours, any timesomeone in the family needs to buy food or, go to work, attend school or even visit a hospital. The community of ́Arab ar Ramadin al Janubi is one of these isolated communities, located close to the Alfe Menashe Settlement. 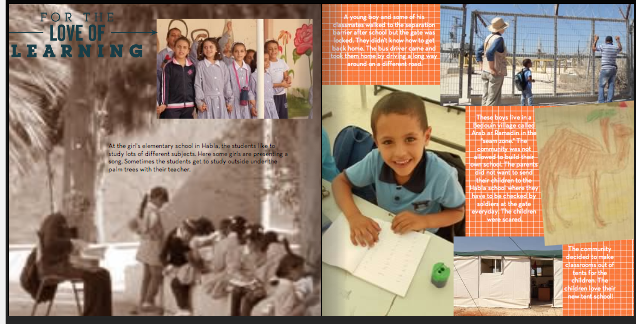 The people of ́Arab ar Ramadin al Janubi have not been able to build a school, as it is nearly impossible for Palestinians living in Area C of the West Bank to obtain building permits from the Israeli Civil Administration. Many structures in the village already have pending demolition orders. Thus, the children from this community must go to schools in a neighbouring village on the other side of the Barrier, which requires the students to pass through a checkpoint to access their schools. At the checkpoint, soldiers armed with assault rifles and sometimes accompanied by dogs board school buses to check the children’s documents and bags. They often speak to the children in Hebrew, a language the latter do not understand, and there are reports of soldiers shouting at children because they failed to answer questions that they could not understand. They may also call an older student to exit the bus for an unsupervised body search in a small room at the checkpoint, while the rest of the students wait. In the past, there have been reports of incidents where male soldiers have conducted body searches on adolescent female students, and as a result,families have begun pulling their girls out of school upon reaching their teenage years to avoid this from happening to them. Furthermore, students from the Seam Zone who are 16 and older must present an ID card, a permit, and an electro-magnetic card that contains biometric information. Students under the age of 16 must furnish their birth certificates, and photocopies of their parents’ ID cards, electro-magnetic cards, and permits if available. Those who forget their documents in the morning are prohibited from going to school, and those who lose one of their documents during the school day are prohibited from returning home in the afternoon. According to teachers, this extensive search of the bus and its passengers often makes students late for school and unable to concentrate when they arrive, which leads to overall poorer grades when compared to other students. Moreover, many of the people from ́Arab ar Ramadin al Janubi do not have permits; thus, they cannot cross the checkpoint, as they would not be allowed to return to their homes. This prevents parents from accompanying their children on their commutes, meeting with teachers to discuss their children’s studies, or picking up a child who may be ill, and even if a relative of a student has a permit, he or she cannot go to the school mid-day to tend to an ill child, because the checkpoint is only open from 7:00AM-9:00AM and from 1:00PM-2:00PM. The time restriction also prevents students from the Seam Zone from participating in extra-curricular activities, class trips, summer camps, etc. 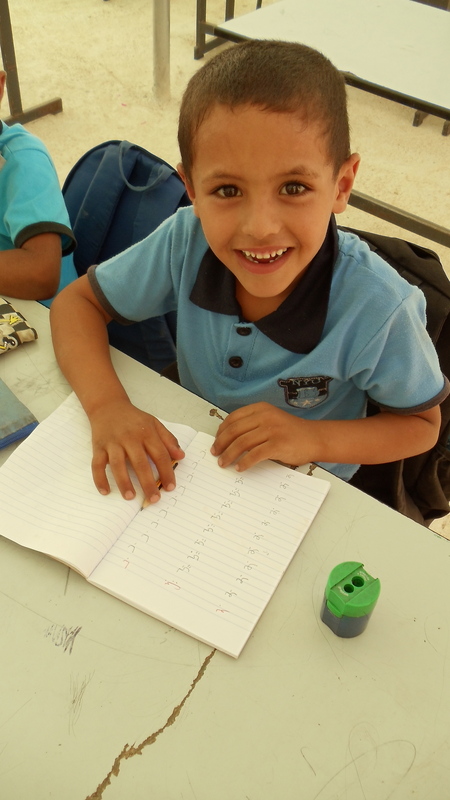 The Director of Education in Qalqiliya said that they are trying all that they can, but there is little that they can do to help Palestinians living in the Seam Zone as they are out of reach. He did however highlight a pilot project that was implemented in October 2012 in ́Arab ar Ramadin ash Shamali, another nearby Seam Zone community. In this village the Ministry of Education (MoE) donated four large tents to be used as a makeshift school for 24 first through third grade students from the community. Though tents are not immune from demolition, they are less likely to attract attention, and if they are demolished, they can be re-erected with minimal cost and time. Of all the sunflowers that I planted last year, the one that flourished most was a surprise to me. I transplanted a handful of seedlings to the yard. They grew and grew. They also became tasty treats for grasshoppers as evidenced by the holes left behind in the leaves. One day, I noticed one plant’s stem was sawed in half. It was hanging on by a thread. “What did this?” I wondered and felt sad for the little plant. My neighbour suggested it might have been a cutworm. I didn’t have the heart to pluck it out of the ground. So I left it. Gradually, the plant formed a scar at the cut and the stem became thicker there. The stem formed a right angle and continued to grow up. The stem became thicker than the other sunflowers that grew tall but were thin and flimsy. The plant eventually recovered and produced more flowers than any of the others. The cut, the scar, the regrowth and regeneration of the plant actually seemed to make it hardier and more resilient than the others. What a lesson! This year, it was the same routine. I transplanted seedlings to the yard outside my window. There was another plant already starting to grow out there. At first I thought it was a weed but suspected it could be a sunflower so I left it. And indeed, to my delight, it was a sunflower! Now this sunflower that planted itself from last year’s seeds is doing brilliantly. It exceeds the others in height and number of blossoms. Nature has produced something more amazing than I could have planned or prepared myself. I don’t consider myself a serious gardener. I put seeds or roots in pots and see what I can nurture into life. This is what the garden teaches me: to be humble, to be open to surprise, to respect the land. It is always an experiment full of surprises and lessons. 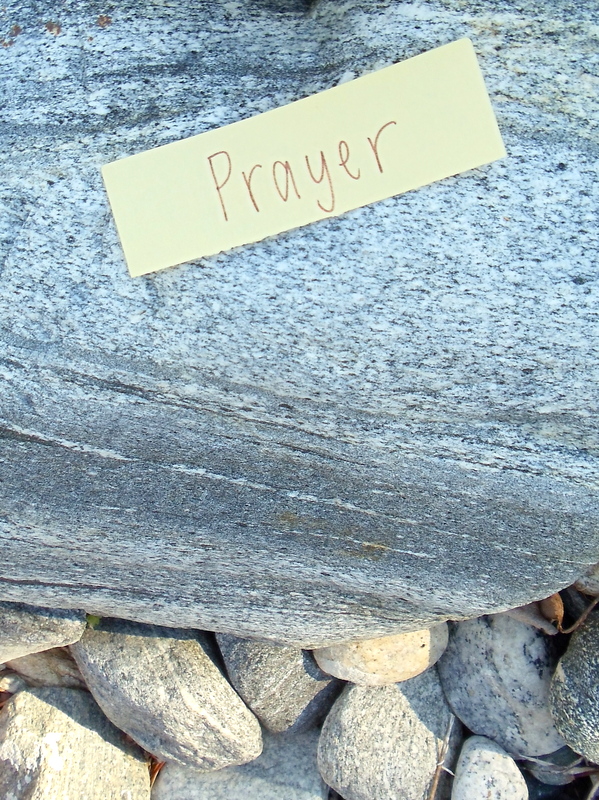 For years, rivers and creeks have called me into a practice of prayer. From the river flowing from Lac Leman to the creeks that feed Okanagan Lake, I have been inspired to reflect on the movement of the water. Standing on a bridge or on a bank near the river facing downstream: I identify all that I need to let go. All the things I don’t know I need to let go of, I surrender to the wisdom of the Almighty One. Facing upstream, arms wide: I identify all that I am open to receive. I am open to surprise, mystery, grace, guidance. As I open my posture and my spirit to this practice, the sound of the water washes over me, cleanses me, makes me feel renewed and whole. Outside Bethlehem lays the Nassar family’s farm. At their gate is a stone with the words painted on it “We refuse to be enemies.” They call this place The Tent of Nations. The first time I had the chance to visit this farm in 2011, one of the family members explained that their land is under threat of confiscation. They are continually asserting their right to live and farm peacefully on the land of their ancestors. Next to their farm is an illegal Israeli settlement, one of many in the occupied Palestinian territories. When settlers showed up with guns at their gate one day,the Nassar family welcomed them to visit but without guns. Thus the rock painted at their gate, which is their message of peace and hope. They want to stay on their land and live peacefully with their neighbours. When the news reached us last week that soldiers arrived at their land early in the morning and bulldozed 1,500 to 2,000 apricot and apple trees and grape vines, I felt a deep pain for this family. Their presence and persistence on the land is a testimony of faith and hope. In addition, their farm is an example of ecologically sustainable use of resources with solar power, rainwater collection, dug out cave residences and meeting room. Because of the occupation they have to be creative with their use of resources. We have so much to learn from them! Hundreds of local and international volunteers visit the Tent of Nations and help out with the work of planting and harvesting. They also have summer camp programs for children. 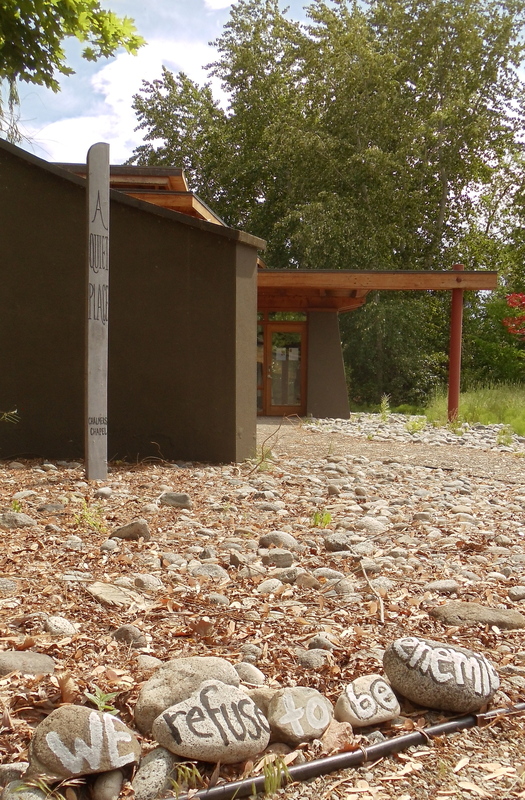 As I looked back through my photos of the Tent of Nations, the rock “We refuse to be enemies” really spoke to me in our current situation here at the Centre at Naramata with the labour dispute. There may be times in our lives when we are tempted to dehumanize people and turn them into ‘Other.’ It is so easy to get sucked into righteous battles of who is right and who is wrong, who is the victim and who the oppressor. “Good question,” I thought to myself and one I have been considering a lot lately. Jesus taught us that love is the greatest commandment of all. We are taught to love our neighbour as ourselves and love our enemy (Matthew 22:36-40; Matthew 5:44). The Nassar’s message at their gate interrupts the temptation to turn people—colleagues, family, neighbours, and strangers—into enemies at all. If we continue to see the humanity, both the beauty and suffering in each person, we may be able to fulfill what Christ called us to do and be. So here is a statement of hope and courage from the Centre in the midst of a very trying situation. I choose not to see other people as the ‘enemy.’ This photo is outside of our Chapel, a quiet place for prayer and community coming together. These stones are a sign of solidarity with the Tent of Nations and people everywhere working for healing, justice and peace. If you would like to support the Tent of Nations, please visit their website: www.tentofnations.org. Talk to people about what is happening there, write to your government officials, ask your church or community group to speak out about it. Make your own “We Refuse To Be Enemies” rock and place it outside of your home, school, work or place of worship. Post it on your Facebook and share the Tent of Nations Story. To support the Centre at this time, please pray for all staff, the local community and all people who cherish this place. These words brought tears to our eyes. It seems like Isaiah is speaking to the reality of Jerusalem today. East Jerusalem, the West Bank and Gaza have been under military occupation for over forty-five years. After the British colonial rule in the region, a plan was made to partition the land to create the state of Israel and a state of Palestine. 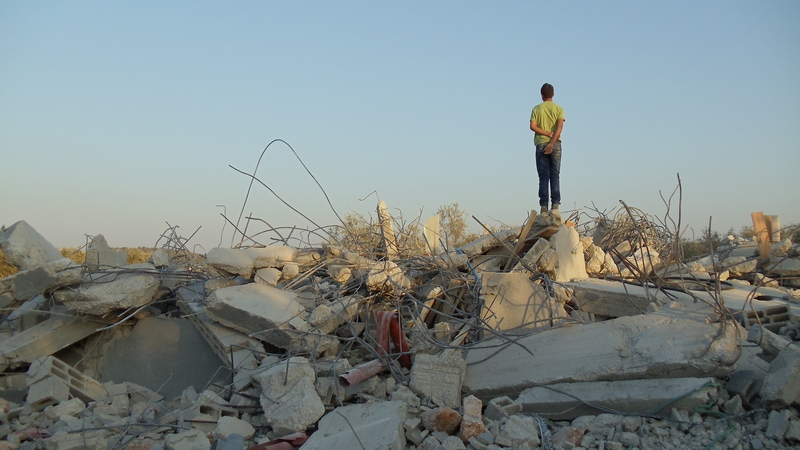 Until this day, Palestinians have not had their right to self-determination realized. Instead, Palestinians live under a system of military occupation that makes everyday life unbearable. Successive waves of Palestinian refugees who reside in the West Bank and surrounding countries have not been allowed to return home over the past several decades and subsequently there are over five million Palestinian refugees in the world today. Many Christians leave their homes because of the occupation which limits their mobility, employment opportunities and threatens their security. Their community has shrunk substantially and today Christians only make up two percent of the population in the region. Our Palestinian sisters and brothers in the faith have rich family histories that connect them to the earliest Christian communities. Their connection to the land and stories of our Christian faith are an invaluable part of our ecumenical family and they need our support to live in peace and dignity in their ancestral lands. And I am reminded of farmers I met who cannot access their agricultural land because of the separation barrier, permit system or because their olive trees were bulldozed by the Israeli military or burnt to the ground by illegal Israeli settlers in the occupied Palestinian territories. They struggle to make a living and feed their families. And for Isaiah’s prophecy that no more will there be weeping, distress and youth who die at a young age, I am reminded of the dehumanizing realities children must face. Lets pray and act for the children who are arrested and held in Israeli military detention sometimes without adult accompaniment or fair legal proceedings. And lets pray for the children whose homes and schools are demolished or who must pass through a military checkpoint just to get to school. Though Jerusalem is only three hours by bus from Jayyous, to obtain a permit to enter the city is very difficult for Palestinians. Another friend of mine in Bethlehem, only a short distance away from Jerusalem, has not been able to go to the annual Easter celebrations with her children that take place in the city also because of the difficulty involved in obtaining a permit. Jerusalem is a special city. It is a holy place for Jews, Muslims and Christians. Unfortunately many Palestinian Christians and Muslims cannot enter the city walls even for special religious holidays. The vision for the city around the time when the state of Israel was created in 1948 was that Jerusalem should be an international city shared by all. But the separation barrier and Israeli military checkpoints have turned it into an exclusive fortress and a hell for those Palestinians living under the reality of military occupation. So this year, when you are at church and hear the name Jerusalem read in the scriptures, remember that this is a city that needs our prayers and advocacy. It is a divided city and a place where there are indeed “cries of distress” as the prophet Isaiah mentions. You are invited to pray, educate yourself and others and advocate for peace and justice during this week and throughout the year. 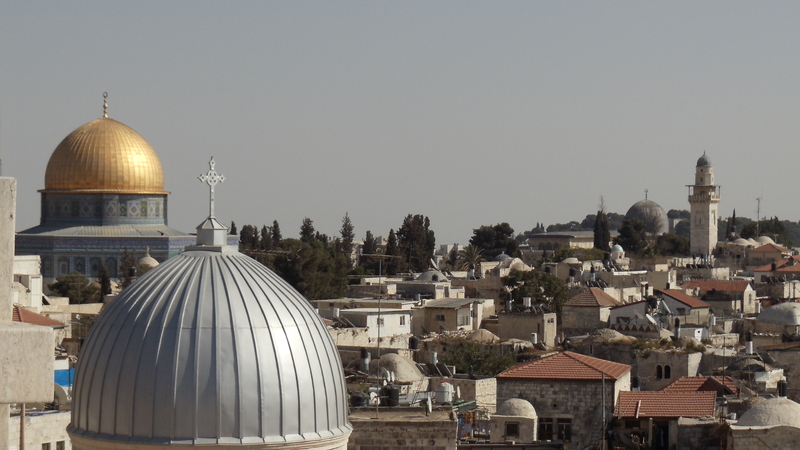 The Palestine Israel Ecumenical Forum (PIEF) of the World Council of Churches has put together resources as we pray and act with our brothers and sisters in Palestine and Israel. Human Rights Are For Children is a picture book of stories for children about children. I have the privilege to cross paths with many children and youth in the work that I do. My question is, how can I share with them some of the stories of children who have to cross a military checkpoint to get to school everyday? How can I talk about Israeli youth who don’t want to do military service even though it is obligatory for them? As I continue to do advocacy work on human rights issues and raise awareness about the situations in Israel/Palestine I notice my impatience working with adults who claim “it’s all too complicated” or “there will always be fighting and conflict over there.” I have found that a good entry point for people to understand the military occupation is to share some of the everyday realities for many Palestinian children. They live under abnormal circumstances and their testimonies can enable people to wake up to the unfairness of the occupation. I have also learned in justice related work that it is important to be able to talk about complex topics in accessible ways. I remember one time when I was having dinner with a former colleague of mine and she asked if I would explain to her children (in middle school) what I was doing with EAPPI in the Westbank. It was a challenge. What is an age appropriate way to talk about some of these issues? Of course the most powerful narrative is a personal one – the stories of other children their same age and what they might have to go through on a typical day. It is important to point out commonalities and our shared humanity with people who might seem so far away or different from us (i.e. children in Jayyous like to play soccer too). 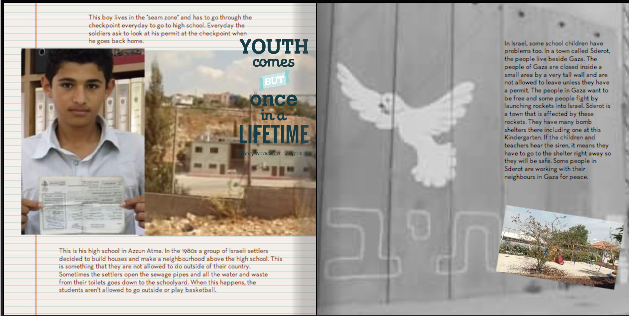 At the same time as uplifting the human side of the story, it is important to show how abnormal the military occupation is and what it does to Palestinian and Israeli young people. I have become increasingly passionate about the issue of children’s rights after visiting with Palestinian families whose children were arrested and detained by Israeli military without any charges laid, without accompaniment of a parent, adult or lawyer. I have started to educate myself more on the UN Convention on the Rights of the Child. I am realizing that all children everywhere need a human rights education. For children here who I hope to share this book with, the aim will be to get them interested in human rights and to encourage them to learn and ask questions. I want them to know that they have a lot of power to speak out and act for peace and justice! At the girl’s elementary school the students like to study lots of subjects. Here they are presenting a song. Sometimes the students get to study outside under the palm trees with their teacher. Here some boys who are five and six years old walked to the separation barrier after school but the gate was locked. They didn’t know how to get back home. The bus driver came and took them home by driving a long way around on a different road. These boys live in a Bedouin village called Arab ar Ramadin in the “seam zone.” The community was not allowed to build their own school. The parents did not want to send their children to the Habla school where they have to be checked by soldiers at the gate everyday. The children were scared. The community decided to make classrooms out of tents for the children. The children love their new tent school! This boy lives in the “seam zone” and has to go through the checkpoint everyday to go to high school. Everyday the soldiers ask to look at his permit at the checkpoint when he goes back home. This is his high school in Azzun Atma. In the 1980s a group of Israeli settlers decided to build houses and make a neighbourhood above the high school. This is something that they are not allowed to do outside of their country. Sometimes the settlers open the sewage pipes and all the water and waste from their toilets goes down to the schoolyard. When this happens, the students aren’t allowed to go outside or play basketball. In Israel, some school children have problems too. In a town called Sderot, the people live beside Gaza. The people of Gaza are closed inside a small area by a very tall wall and are not allowed to leave unless they have a permit. The people in Gaza want to be free and some people fight by launching rockets into Israel. Sderot is a town that is affected by these rockets. They have many bomb shelters there including one at this Kindergarten. If the children and teachers hear the siren, it means they have to go to the shelter right away so they will be safe. 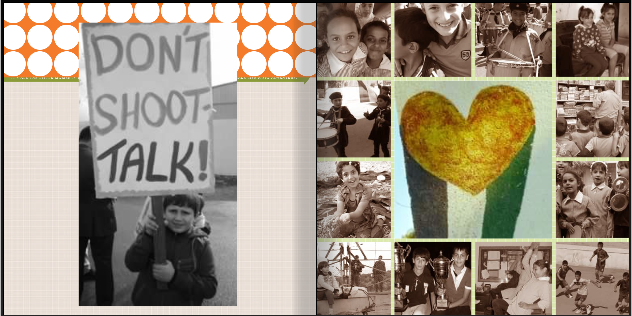 Some people in Sderot are working with their neighbours in Gaza for peace. There are many young people in Israel who are working for peace. They want a good life and want Palestinian people to have a good life too. This girl came with her parents from Israel to visit her friend Naim and his family in Jayyous (Westbank). They helped during the olive harvest. Every young person in Israel has to join the military when they are finished high school. Many young Israelis don’t want to join the military.